Democratic presidential candidate Sen. Amy Klobuchar speaks during a meet and greet with local residents, Sunday, March 17, 2019, in Cedar Rapids, Iowa. 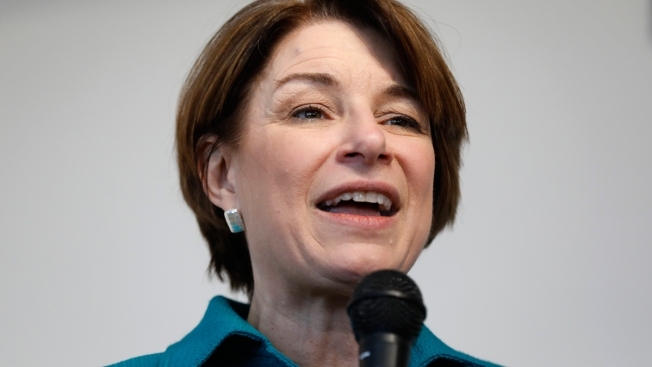 Democratic presidential candidate Amy Klobuchar is pitching an infrastructure plan she says will provide $1 trillion to fix roads and bridges, protect against flooding and rebuild schools, airports and other projects. The plan announced Thursday is the first policy proposal from the Minnesota senator since she joined the 2020 race with a snowy rally not far from where the Interstate 35W bridge collapsed into the Mississippi River in 2007. Klobuchar speaks often on the campaign trail about the collapse, which killed 13 people, telling voters "a bridge just shouldn't fall down in the middle of America." The plan calls for leveraging $650 billion in federal funding through public-private partnerships, bond programs and clean-energy tax incentives. It would restart the Build America Bonds program President Barack Obama's administration created to help stimulate the economy during the recession. About $400 billion of the $650 billion federal spending would come from raising the corporate tax rate from 21 percent to 25 percent. The rate was cut from 35 percent to 21 percent in President Donald Trump's 2017 tax bill. Klobuchar also calls for closing tax loopholes and imposing a "financial risk fee" on large banks. Klobuchar has criticized Trump for pledging to pass a "significant" infrastructure plan but not doing so. Her campaign says her plan provides a "concrete, common-sense" way to fund infrastructure investments. Those include connecting every U.S. household to the internet by 2022, modernizing public transportation and investing in renewable-energy development and drinking and wastewater systems. Klobuchar plans to discuss the proposal during stops Friday and Saturday in Iowa, where she will visit communities struggling with major flooding and a lack of clean drinking water.